The Grazalema National Park is a great location for a self-guided walking holiday in Andalucia with spectacular limestone and dolomite crags that rise dramatically above beautiful gorges. 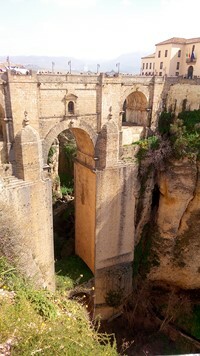 Walk between beautiful villages with some great accommodation and on the final day visit the spectacular village of Ronda. Alpujarras in the Sierra Nevada has wonderful landscapes and a rich flora, but it's perhaps best known for its unique villages with their traditional Moors architecture; white box-shaped houses clustered among the hills. A choice of walks on most days allows walkers of different abilities to enjoy the Alpujarras area, where your holiday would not be complete without a day in the historic city of Granada and a trip to the amazing Alhambra palace. Our 10-night walking holiday in Andalucia is designed to experience the finest trails through the two best national parks for walking in southern Spain. Start in the fabulous town of Ronda and then walk through Grazalema National Park before taking the beautiful Ronda to Granada train journey. After spending a day in Granada, follow the Las Alpujarran valley with some walks exploring the Sierra Nevada mountain range. Andalucia is a large autonomous region of southern Spain which includes much of Spain's southern Mediterranean Coast as well as its Atlantic Coast and the Sierra Nevada Mountain range which is the highest in Spain. It was under Moorish rule from the 8th-15th centuries, a legacy that shows in its architecture, including such landmarks as the Alcazar castle in Seville, the capital city, as well as Granada’s Alhambra palace. Andalusia is home to the hottest and driest summers in Spain, but in the west, weather systems from the Atlantic ensure that it is relatively wet in the winter, with some areas receiving plenty of rain. Contrary to popular opinion, as a whole, the region enjoys above average yearly rainfall in the context of Spain and Grazalema has the highest totals in Spain with heavy winter rains leading to a lush vegetation and a large range of wildlife. We cover two areas in Andulacia the Grazlema National Park between Seville and Malaga and further east the Alpujarras in the Sierra Nevada. Located in Andalucia in southern Spain, the Grazalema National Park is a great destination for a self-guided walking holiday with spectacular scenery and wildlife. Grazalema was the first Spanish National Park to be designated in Andalucia, following its recognition as a Biosphere Reserve by UNESCO. The Sierra de Grazalema upland area has an exceptionally rich wildlife with Europe's largest population of Griffon Vultures. In addition mammals include roe deer, Egyptian mongoose and Spanish ibex. Grazalema has a seasonal wet season which helps create an oasis of green among the Andalucian landscapes with an extraordinary array of plant life. As well as the rich wildlife and stunning countryside, Grazalema and the surrounding area is home to some beautiful villages with typical Andalucian white-washed properties. We link together some of these villages on our self-guided walking holiday staying in great accommodation. On the final full day of your walking trip you'll visit Ronda, a spectacular town built on the edge of huge cliffs with its old and new towns separated by a gorge, spanned by an immense bridge. Most of the Alpujarras area falls within the Sierra Nevada National Park, which is home to almost one third of the total flora of mainland Spain. Wildflowers include the sandwort and the Nevada clover, the Nevada violet and the Sierra chamomile. Spring is one of the best times to come walking in the Las Alpujarras if you have an interest in wildflowers. There is also a fantastic array of other wildlife to be seen, most notably the Cabra Montes, the Spanish ibex, seen on rocky outcrops, which is a common occurrence and great to see on any walk. The cultural interest of this part of Andalucia lies in its fifty-odd villages, which were the last stronghold of the Spanish Muslims, or Moors. Soon after the Castilians took Granada in 1492, all the city's Moors were forced to convert to Christianity. Those people who refused took to the hills, settling in this remote, inaccessible area. Constant pressure from the Christians led to a bloody uprising, the Morisco rebellion of 1568, which was ruthlessly crushed, with the public execution of the leader, Ben Humeya, in the main square of Granada. A royal decree followed expelling from the Kingdom of Granada all people of Arab descent, since the "new Christians", as the converts were called, were all suspected of being "crypto-Muslims" in secret. The villages of the Alpujarras were resettled with some 12,000 Christian families brought by King Philip II from Galicia and Asturias in north-western Spain. However, these unique hamlets have retained their traditional Berber architecture - terraced clusters of white box-shaped houses with flat clay roofs - still common in the Rif and Atlas Mountains of Morocco. March to June & September to November is generally dry (although, if it does rain, it pours), with warm/hot sunny days and bright blue skies, perfect for walking at any altitude. July & August are very hot and only high altitude walking is recommended. December to February is the coldest time of year with some frost at night and a chance of rain or snow but there are many bright sunny days which are perfect for walking at low altitudes. A visit to this part of Andalucia in Spain would not be complete without a day in the historic city of Granada and a trip to the amazing Alhambra palace.